This page is just a placeholder for random entries on other topics I'm interested in. I'll be sure to add new things from time to time. 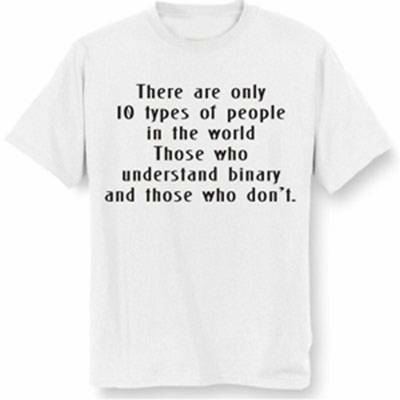 I must get a tee-shirt like this! It's been a long time since I wrote anything resembling a computer program - some HTML and a little light scripting really doesn't count! But I flatter myself to think that I could still do it if I had too. On the other hand, it's probably all different nowadays. This was brought home when reading the novel Halting State by Charles Stross. Good book, by the way. I particularly like the strange and amusing comparisons one can discover when considering the vagueness of the English language. Here's one I came across recently. I'm well aware that a Pork Butcher is one that sells prepared joints and cuts of pig meat. 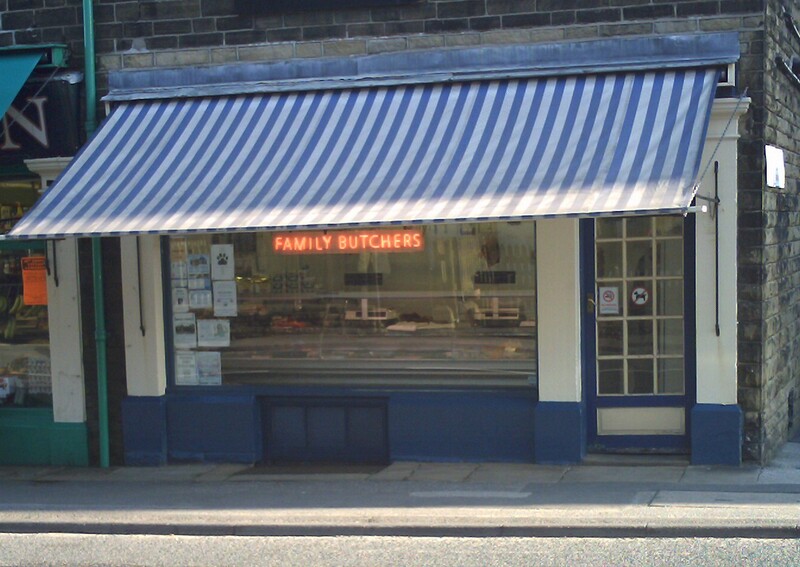 But presumably a Family Butcher means something completely different? No? I've been passing this shop every day for a year on the way to and from work (it's in the outskirts of Keighley in Yorkshire), and it's amused me on every occasion! 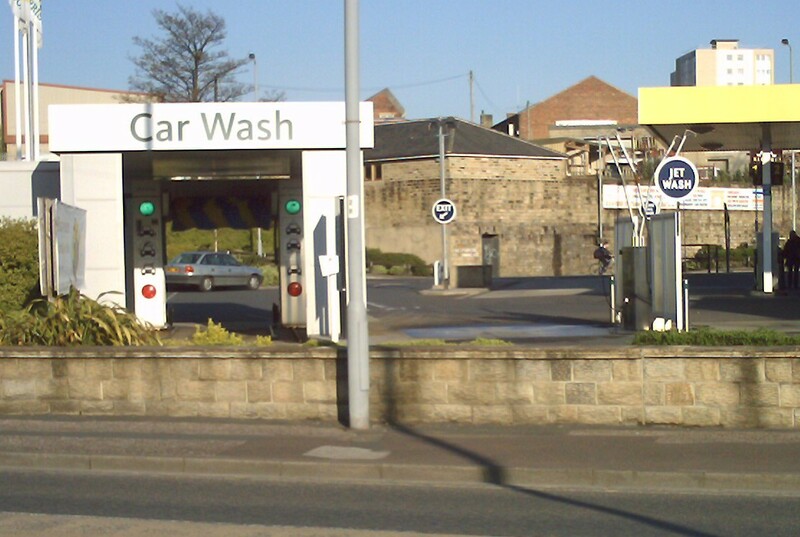 And here's another one, also in Keighley. I've laughed every time I've been forced to stop at the traffic lights on the way home. People have looked at me strangely. I'm a great fan of Dilbert and The Simpsons. I'm also very fond of the Hitch Hiker's Guide To The Galaxy, especially the original broadcasts on BBC radio. At one time, I'm sure I had the entire radio series committed to memory. More on HHGTTG here. I'm a regular reader of The Register, an online IT daily newspaper with an amusing line in investigative jounalism - in a style usually summarised as News of the People!!. I particularly like the BOFH feature; BOFH stands for B*stard Operator From Hell. I particularly like the Windows Earth screensaver by John Walker available from Fourmilab. This has evolved over the years, and I do like the nightside representation with lit-up urban areas. 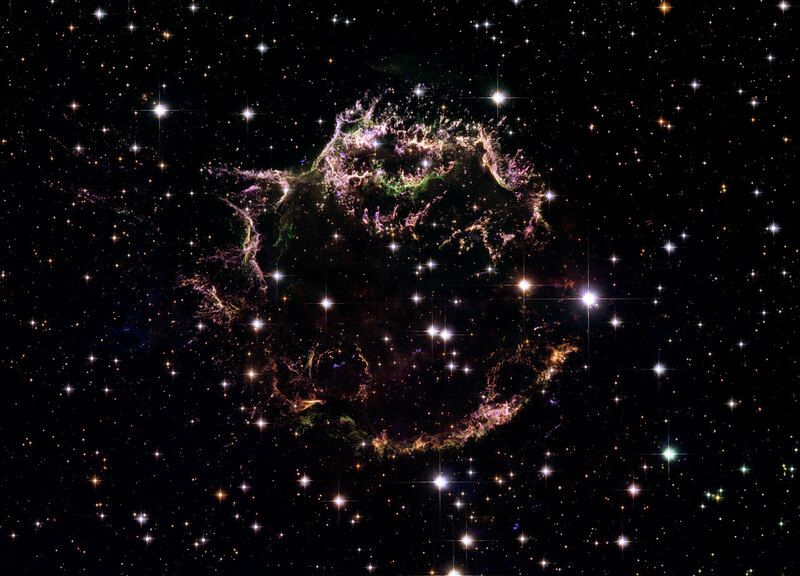 My current wallpaper is a false-colour representation (based on Hubble Space Telescope data) of a supernova remnant in the constellation Cassiopeia, known as Cassiopeia-A. I'm an extremely enthusiastic cook: indeed, I've maintained for many years that cooking is the idea hobby for men. Think how theraputic it is to come home after a hard day in the office, and attack an onion with a very large kitchen knife. In addition, you're allowed to play with fire, use all the gadgets you can think of, and you can have lots of sharp knives. And, when you've finished, with a bit of luck, you can eat it. Obviously for men! We all like our picnics. Here's a nice shot of Tracey and Sebastian enjoying luncheon! Lots of smelly cheeses and salami. For some reason, you can't see the wine in this particular picture - but there's usually some around somewhere! A few of my favourite recipes can be found on my Cooking for Men website, as well as some of my favourite cocktails. I've been preparing these and other meals quite a lot recently, since Tracey has been working so hard. There are a few pictures of the kitchen at home here. If you look closely, you can just see the "Danger - Men Cooking" sign on the wall. I've recently developed an interest in gardening. Partially, this was forced upon me since our long-term gardener left, but I have found I've enjoyed it. It's certainly nice to be outside as much as possible. There are a few pictures of the garden at home here. I'll write more on a few gardening projects later. In particular, I'll include something on the pergola that I (with some help) constructed for Tracey as a present, as well as the Weeping Willow tree (Tracey's favourite) that I planted for her. I'm one of those people who will read anything - I can't help it. I probably read much too fast. Even so, I've acquired a considerable collection of books over the years, a few of which can be seen here. Indeed, it is the lack of new good books that is one of several reasons that lead me to take up writing fantasy fiction myself. A few decades ago, I took up gliding. I even managed to reach a solo standard, and have a few solo hours in the air. At the time, unfortunately, I found that I could afford neither the time or the money, so I ceased. Maybe this is something I could get back to one of these days? I still hold a UK Amateur Radio licence - callsign G8TYY - and remain a member of the Radio Society of Great Britain. I'm not at all active on the bands; I don't think I've spoken into a radio for several decades. At one time, I was very active. I was for many years a member of the South Manchester Radio Club. I was involved in DX contests on the VHF and UHF bands, which involved a lot of overnight operating from drafty tents on wind-swept hilltops. I engaged in Top Band radio direction-finding (DF) events, which involved a great deal of running around in dark woods. I'll write more about my home-construction of radio and electronic equipment another time. However, I was awarded (with Dave Bolton, G8UQC) the RSGB Ostermeyer Trophy in 1984, which is awarded for the most meritorious description of a piece of home-constructed or electronic equipment published in RadCom. The article was the Beermat Mk.II Direct Conversion Receiver, so named since the original design sketches were drawn in a pub, on the back of a beermat - and, yes, while drinking beer! I have started using some of my experiences as a Radio Amateur in some of my short stories: Anomalous Propagation, Dust of Angels and Broken Box. These are all part of my Four Square Less One collection. Something I do very, very occasionally, and only in the Indian Ocean. Far too cold anywhere else! In any case, these days I tend to stick to snorkeling. Tracey and I have enjoyed fast cars for a long time. Tracey bought me a Lotus Elan before we were married - the thing's a girl's gotta do to get a chap to marry her! I think this all fits into one of the categories: Fast Cars, Fine Wines and Beautiful Women - all things which probably count as either illegal, immoral or fattening. We had a lot of fun in that car - a pity it was nicked from the garage forecourt where it had gone for a service and minor repairs. Otherwise, I'm sure I'd still have it. Since then we've had a 5-series BMW, a couple of Saabs, a couple of Jaguar XJ6s, a Jaguar XKR (old shape), and an old-shape Mercedes SLK230. You can see some of these here. Right now, we have a Jaguar XJR. My name spelled backwards is Rovert Luap Snikpoh. Not sure why anyone would want to know that... I also note that there is a place in the English Lake District known as Torver - which is of course an anagram of my name. In conversation with a colleague, I was reminded of the unmaintainable code pages. Recommended!